I am currently a missionary and the Communications Director at New Life Global Ministries. I love what I do and the people around me. Life is about following Jesus and loving people. I want to leave the world a different place than what I found it. Getting a college education is the pathway to finding or pursuing your passions and launching your career. Through a liberal arts education that includes general education classes, major classes, minor classes, and general electives, Shepherd students expand their horizons with an array of new knowledge, experiences and skills. That’s a lot to show off to future employers! The best way to flaunt your stuff, the runway walk of business if you will, is the resumé and one Shepherd Communication class takes it to the next level! Comm 352 Computer Mediated Communication is a major requirement in the Shepherd Communication department. That means everyone has to take it. But, it’s great at making you look good. It teaches you the fundamentals of how to communicate effectively and impressively on the web, such as through proper HTML code. These skills not only help you understand how communication works, but provide you with tools to wow a future partner or employer. Coding your own resume in HTML is one of the many practical projects you will enjoy in this class. Not only does it show how awesome you are by showing all of your experience and skills, it also shows that you can code like a champ! Samples from my HTML coded resume. Click to enlarge. The skillet can take you far beyond building a resumé, of course. You are only limited by your imagination when it comes to coding. Communication student David Donohue recently discussed how he uses what he learned in Comm 352 at his internship at a non-profit in Shepherdstown. Learn more about the benefits of Comm 352 from Professor Larson. Want a taste of what learning coding is like? Check out codecademy.com today and experience a taste of the fun you will have in this class! Hopefully you’ve enjoyed a fun filled winter break and are ready to get back to the daily grind of a new semester! Julia is in the digital film making concentration so her interests are in film and television.She even won first place in a nationwide video contest her senior year of high school! After graduation she plans to get a job working behind the scenes on either TV shows or movies. She chose communication because she was very technical in high school and took up media broadcasting there. She is producing and editing a radio drama in her sound design class which she says is really cool! Any advice for the new students? Whenever you have the time, try to play with new software. The more you play and practice, the more you can use on projects and outside work. 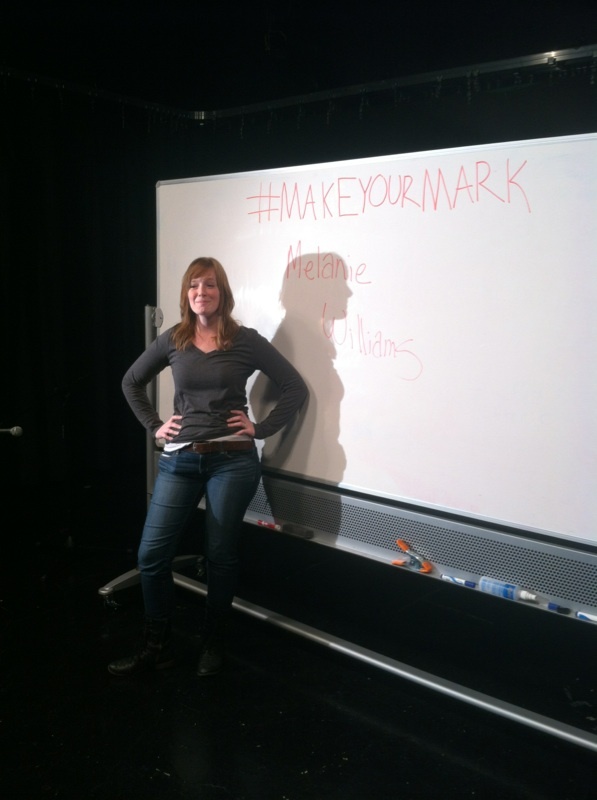 Now the question is, how will you #makeyourmark? Follow @sucomm on Instagram and @shepcomm on Twitter to always stay in the loop! If you are a Communication student, you will run across the need for an Internship in your major requirements. There are ways to get out of it, but from me to you, DO AN INTERNSHIP! The reason for this requirement is for the benefit of “real world” experience and training. This 3-6 credit hours could truly shape your transition from college to the working world. So do it! I am hoping that I can give you a little insight to this process because I am uniquely placed in the middle of both of these “worlds.” I am currently a full time student in the Communication Department at Shepherd University and a full time employee. How did I get there? My internship turned into my job! Internships come in many shapes and sizes. Shepherd University and especially our Communication Department are great at sending information about available opportunities to students. Keep an eye out and most likely you will find an amazing internship opportunity. My internship included running most of the media outlets and programs for New Life Community Church. I was given hands on experience with programs in the Adobe Suite that I had learned to use in my communication classes. The skills I had already learned when combined with the experience and training I received made me very successful in my first internship. After the success of the first internship and a lot of hard work, I was offered two more internships and then a full time position. Not all internships work like this. But with hard work and the experience you gain you will be a force to be reckoned with in the workplace. Overall, an internship can provide you with the experience that employers look for in college graduates. When you mix that experience with the practical skills you will learn in the department, you are setting yourself up for great success! Take it from me, there is a lot of value in an internship. What makes Shepherd Communication the best kept secret? That’s right, it’s our students! Shepherd Comm students are some of the best and brightest around and they are guarenteed to make a big mark in the world today. 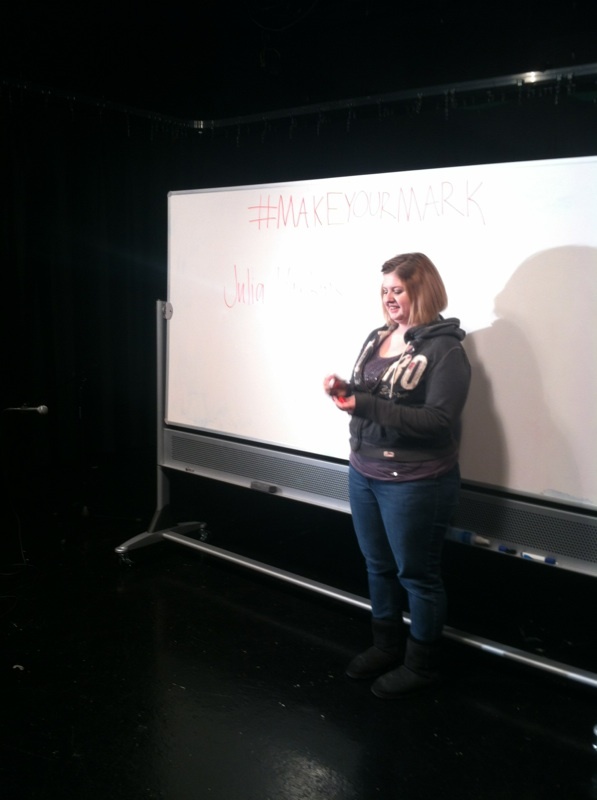 It’s for that reason we are sharing some of their stories through our #MakeYourMark campaign. Let’s meet Melanie Williams, a Communication major with a concentration in Media Studies. Why Communication? She chose to major in communication because she loves the broad range of career paths that it offers. (Seriously, what’s not to love about Communication?). Cool Projects? Melanie is an artist in the making as she is currently rewriting and recording some of her own personal music. She is using the skills learned in her courses taken here at Shepherd to better the audio production of her music. Fun Fact! It’s pretty cool that Melanie has a passion for music, considering when she was a child she couldn’t hear. Her mom would play the piano to help train Melanie’s ears. Advice for New Students? Melanie wants all the new students to know that no one ever really knows what they want to be. “Don’t sweat it, just enjoy the ride”, she adds. We totally agree with you Melanie. After all, it’s about the journey. Not the destination. Every communication student will have the chance to take a practicum class in either news, radio, or new media. These classes are designed to provide the type of hands-on learning that you are looking for. COMM 348 News Practicum focuses on learning the ins and outs of news recording, reporting, and posting stories. Students were given the opportunity to go outside of the classroom and report on the stories that they found exciting and interesting. You can check on the News Practicum Blog to see some of their stories in web format and find access to the audio for each story. Professor Mason began experimenting with smart phone reporting while working with West Virginia Public Radio. She decided to bring that experience into the classroom to help students learn a new set of smartphone skills. News Practicum is a great class to learn practical and useful skills in the Communication Department! It’s that time of year again. The time for hot chocolate, sleigh rides, and late night anticipation of the presents that await us as we all prepare for the holidays. It’s also time for TONS of coffee, rides home from the library, and late night anticipation of what awaits us as students prepare for……FINALS WEEK !!! Stressing over finals week? Worried about getting that lump of coal in your academic stocking? No worries. Winter break may be feel painfully far away. But your friendly Shepherd bloggers are here to help. It doesn’t matter if it’s black, creamy, or sugary. As long as it is within reach or at the nearest Sheetz. Finals week is notorious for requiring all-nighters. Make sure you have plenty of caffeine at the ready if you plan on staying up late. (Not a fan of coffee? There are lots of other caffeinated drinks like sodas). Many professors require a variety of assignments as the semester comes to a close. One of the best things you can have as a Comm student is a strong portfolio at the ready. Your portfolio is a collection of your best work. Each course you take in the Department will prepare you for whatever area of communication you choose to pursue. It’s always good to show off those skills. A portfolio shows what you learned. Isn’t that what a final is all about? Contrary to popular belief, your professors are not magical little elves set to ruin the holidays. They want to see you succeed during finals week because it shows them that you can apply everything that they’ve taught you. One of the best parts about being a student in the Department of Communications is that the professors make themselves readily available for whatever a student may need. They are always willing to answer questions and help you feel prepared. Make sure you know their office hours and email addresses in the event that a question arises. They are experts in their field. Take advantage of that. Kind of a no brainer. Ok fine, bring your Mac too, and maybe a camera. Just make sure to bring whatever you need to be prepared for that final project or test. You have spent the past four months in a class. You read all the books, watched all the films, looked at all the screens (some with pictures of Scout) and done all the recordings. You can do this. You just have to believe it. Go into each final with a positive attitude. Get plenty of rest so you can feel confident. Believe that you can do it and you will! Your professors have gotten you this far. The rest is up to you. Once you have these 5 essential things, you are ready! After finals are finished and our Comm students are out changing the world, everyone will know what Shepherd’s best kept secret truly is! Happy Finals Week to all and to all A GOOD BREAK! !